Today Google added a new feature to its extremely useful Maps service, allowing users to quickly view the layout of public transportation systems in more than 50 cities. While Google’s Transit site has offered automatic trip-planning for a number of areas for some time, the new feature makes it easy to determine at a glance if public transportation is even a viable option. To activate the new ‘Transit Layer’, click the More button towards of the top of the Google Maps interface and check off Transit. The map will display an overlay of each of the available modes of transportation (note that while trains and subways will appear while zoomed out, you’ll need to zoom further in to see more regional buses and trolleys). 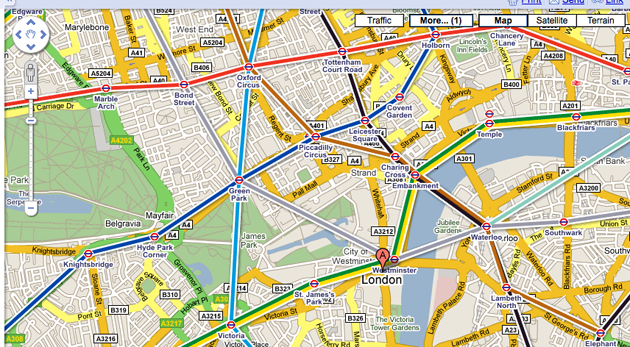 Don’t toss out your Tube map just yet though. These maps are geographically correct, unlike the ones provided my most major metro lines (which are typically simplified for ease of use), so using them to route a trip can be confusing.